from all over to revel in the warmth emitted from the community event. The event, in aid of the carnival club, offers a variety of car boots and stalls with a huge range of items for visitors with an eye for a bargain. A whole host of family orientated activities will ensure everyone will be entertained throughout, including performances from some of the best majorettes in the town, delighting crowds with their dedicated and well-rehearsed routines. 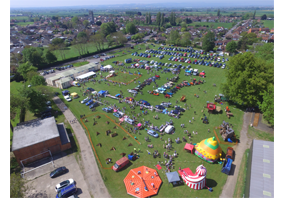 Excited children will have the chance to bounce the day away on the bouncy castle and for the adults, an impressive array of vintage vehicles will be exhibited, bringing back memories of when cars were made with real craftsmanship. The event takes place in the Community Centre field from 12-4pm. Inside stalls are 15 per 5ftand outside stalls are 15 per 8ft. Car boot stalls are 6 per 6ft, and trade stalls are 15 per 8ft. Setting up time is from 10 am onwards (no earlier, if you come before 10 am you will have to wait) and all booking fees are non-refundable.